Dawn. The clouds advance on all sides, and the air smells faintly of rain. July 5th, the day in which the world finally gets down to the real business of summer, and perhaps the forecasts will prove right after all. For us, that would be much more than a blessing right now, in the face of record drought. Climate change has hit this land increasingly hard in recent years, and this year has been our worst yet: No rainy season, nor even a few drops here and there; no water from the mountains; an earth rapidly browning as the green fades before our eyes. And even that is not precisely accurate, at least not in terms of color. We say (in English, at least) that dried grass turns “brown,” but here, at least, that’s not true. The grasses native to this land do not so much scorch as fade: Instead of the heat charring them into a burnt umber, it tends to bleach them like the small bones of the earth itself, leached of color until they turn a pale washed-out gold. The earth itself, the soil, maybe be brown — its clay-like texture now talc-y and dry as dust — but the grass is the same wan yellow as a winter’s sky. In a week when we are praying for a return of the green that normally marks this season here, the striations of the fields reminded me of one of Wings’s works from about a decade ago — or, to be more precise, it reminded me of the stone that served as its focal point. That particular cabochon, big, bold, and round, was labeled Royston turquoise, and so it probably was; some of the best materials that Royston has to offer features a brilliant emerald green and patchy bits of matrix in shades of deep metallic bronze, golden brown, and pale yellow-gold. But looking at the stone now, I wonder whether the seller misidentified it; even after all these years, I recall the bracelet itself sufficiently to know that the photo is accurate as to color and appearance. Nevada has a few other mining districts where such colors appear, although some, like Carico Lake and Damele, manifest in patterns that are both immediately recognizeable and very different from this one. Stone Mountain turquoise often includes greens, but they are usually paler, softer shades; the pale yellow matrix is, however, one of that mine’s other hallmarks. This stone, though, was different. It had been cabbed smooth in relative terms and polished to a medium gloss, but it still held the texture of the stone in its original form: a lightly waved and rippled surface, following the striations of color, with the matrix lines and patches still textured to the touch. More, the colors manifested differently from what is commonly found in Royston (or other Nevada) turquoise, with a lined and layered appearance, as though the stone were robed in veils of faintly-differing tints of deep emerald green edged with metallic golden-yellow and -brown tassels and fringe. It all makes me think of a mine much closer to home: the old King’s Manassa Mine, not far north of here in southern Colorado. Manassa turquoise sometimes appears in rich blues, but it is best known for its deep greens and browns, the colors of our Rocky Mountain cottonwoods and conifers in full summer flower. At any rate, the unusual nature of the stone tells me that Wings began the design with it firmly in mind and built the bracelet around it. But design and execution are two different things, and the latter, as always, began with the silver. Instead of his more usual cuff, this was to be a hook bracelet, which meant a difference in weight, shape, and tension. Wings creates hook bracelets semi-regularly, but in small numbers. He rarely has more than one (if that) in inventory at any one time; at the moment, he has only one available in this style. Whereas a cuff is meant to be relatively solid, with just enough give to be able to close it enough to stay in place on the wrist, a hook bracelet must have substantial give — flexible enough to push inward in order to open or close the clasp, yet solid enough not to bend or break. Once in a while, Wings will cut the band to flare outward slightly at either end, making the to ends that meet the stone slightly wider than the part of the band that goes on the underside of the wrist. He wrought this particular work in his more usual style, however, with the band of the same width throughout its length. Cutting the band freehand is not quite as simple as cutting a single long slender rectangle, however. At either end he left a slender tab of silver, excising the rest of the metal around it so that what resulted was a length of silver about a half-inch high and six inches in length, rectangular save for a much slimmer rectangle extending organically a half-inch or so from either end. These two tabs would form the clasps that would hold the stone and close the bracelet, respectively, and it was necessary that they be an organic part of the band, since they are the fulcrum points for the tension of opening and closing the cuff. Soldering them on would leave a natural, if mostly invisible, seam that would be a weak point, one that would not survive repeated wear. Then, it was time to turn his attention to the setting for the stone. This was an unusually large cabochon for such specimens; more often, such brilliant greens appear either in small cabs or as one small part of a larger, more typically blue-hued stone. It needed a setting that would not distract from its unusual power and beauty, so Wings traced a circle the size of the stone, then extended its edge a small fraction of an inch beyond that point all the way around. At the center point of either side of this circle, he extended the lines in his mind’s eye to include another tab: a small rectangle, slightly larger where it adjoined the circle than at its end, with what would eventually be a hole excised near that end. He then cut this entire odd shape, this two-tabbed circle, out of the silver freehand using a tiny jeweler’s saw. Once complete, he drilled a tiny hole by hand in each tab close to its end, and using an even smaller saw, cut out a diminutive rectangle. Then he filed all of the edges smooth. He then placed the setting flat on his workbench and fashioned a plain low-profile circular bezel an eighth of an inch or so from its outer edge and soldered it securely into place. Then he soldered a strand of twisted silver on the remaining small space of silver visible between the bezel and the edge. He oxidized all the stampwork and all the seams and joins, and buffed it to a polish just slightly brighter than a traditional Florentine finish. Once buffed, all that remained were the finishing touches. He set the stone securely, then placed one of the bands end tabs through the hole in one of the tabs on the stone’s setting, then crimped it gently closed until its end doubled back on the top of the band. This would prevent the setting from disconnecting while the band was squeezed open or closed. Then he carefully bent the tab on the bands other end inward slightly, drawing its tip back to form a hook. This he used to close the bracelet, feeding the hook through the eye on the other end of the setting. 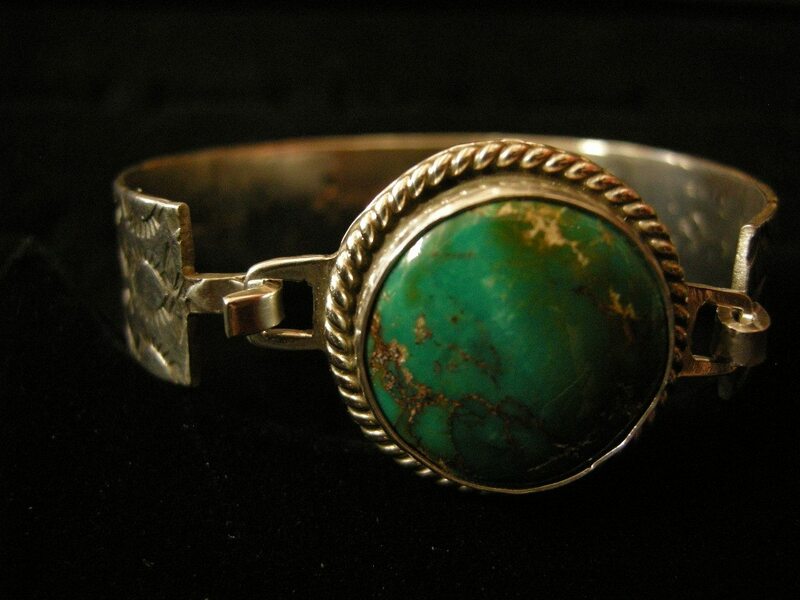 Once complete, the bracelet was an unusually powerful one for its style: an emerald green planet held fast in an orbit formed not of simple stardust but of Eyes of Spirit, cosmic symbols of wisdom, guidance, and medicine. It felt like medicine for a green earth. It’s raining now. Perhaps we are to be granted a little of its medicine today. Posted on Thursday, July 5th, 2018 at 1:26 pm. Filed under: The NDN Silver Blog Tags: The NDN Silver Blog	RSS 2.0 feed.